Amongst the litany of bands playing within the margins of the funeral doom space, few have cultivated a sound that is as instantly recognisable as that of New Jersey’s Evoken. Over the course of their rather lengthy career, they have managed to take the essentials of funeral doom and death metal and envelop them in the densest, most suffocating of atmospheres, leading to a string of albums that revel in the maudlin emotional mires of doom, but project them in a way that can best be described as oppressive and crushing. Hypnagogia - the band’s sixth full length album - comes six years after the excellent Atra Mors, and it brings with it some things of note. 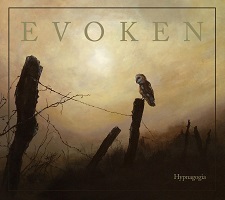 Firstly, Hypnagogia marks Evoken’s first stab at a concept album (World War I being the subject matter in this case), which is a bit surprising considering how long they’re been at it; while secondly, and definitely more importantly, Hypnagogia sees a number of tweaks and updates to the long-running Evoken sound. Perhaps the most immediately noticeable change this time around can be found in the album’s production. Though Evoken have always had an imposing sonic presence, there has also been a certain roughness or even murkiness to the sound, but with Hypnagogia there is a clarity and punchiness of a fashion that I’ve not heard on an Evoken record before. Though it was produced by Steven DeAcutis who also produced 2007’s A Caress of the Void, you wouldn’t really know it because of how contemporary it sounds relative to the rest of the band’s catalogue. In any ordinary scenario, I think this clearer, more modern-sounding production would have stunted the weight and impact of the album’s atmosphere, but in this case it actually serves as a necessary complement to what is, I think, the most significant and I suspect potentially contentious shake-up that Hypnagogia has to offer: that of the song-writing. While there is certainly no shortage of “classic” Evoken to be found throughout the album’s hour-long run time, Hypnagogia sees the band branching out in a number of ways. For example, strings and synths, though a long-running fixture in Evoken’s compositional toolbox, feature much more prominently here than they have previously, and for the most part they’re put to good use by enhancing the compositions rather than dominating them. And from an overall compositional perspective, Hypnagogia is inarguably the most dynamic album in Evoken’s catalogue in terms of its contrast between light and shade, with much more focus having been paid towards the former than would ordinarily be the case. The result is an album that is far more varied in scope than one might expect it to be and, as a consequence, one that is far more accessible. Relatively speaking, of course. While I’ll admit that the route Evoken took with Hypnagogia isn’t exactly what I was expecting (and if I’m being honest, wasn’t really what I wanted either), I’m generally on board with their desire to expand the scope of their sound. They’ve offered up 25-years’ worth of crushingly heavy funeral doom, so I can’t blame the band for wanting to broaden their horizons and try something different. What I am disappointed with, though, is that the results of the expansion are less consistent than I would have hoped for. When things land well, they really land well. Songs like "The Fear After" and "Schadenfreude" in particular stand out as examples of the band’s vision being most satisfactorily realised, but elsewhere there are numerous moments when Hypnagogia meanders a little too much in between its meatier sections. This isn’t new to Evoken (or practically any band in this space), but this is where the absence of the suffocating atmosphere is keenly felt and actually exacerbates the problem. Most surprising to me in the band’s exploration of more melodic motifs, though, was that I frequently had the feeling that Evoken often veered way too close to sounding like Paradise Lost and Mournful Congregation for comfort. It’s not so much the compositional similarities themselves that bothered me, but more that the uniquely special thing about Evoken - their instantly recognisable sound - had largely gone and what replaced it wasn’t particularly unique or necessarily all that special. Though Hypnagogia is less of a resounding success than I was hoping it would be, it’s still a solid hour of mostly good and sometimes great funeral doom that is more than deserving of investigation if funeral doom happens to be your thing. And despite my mixed feelings about the overall results here, I hope this will serve as the first of many steps of experimentation for Evoken going forward.